A South East Asian tropical island. White sand beaches, palm covered jungle, turquoise waters - a Jewel in the Orient, where a sub-hippy culture came to party under the Full Moon over 30yrs ago. A fusion of cultures and musical influences continues to simmer in this vibrant melting pot 3 decades later, growing now into what is, in 2015, one of the most progressive dance scenes on this planet... This is Koh Phangan! A very youthful sixty-something, Colin has been an artist since he was a kid. "I am still a kid", he quips, with that quick-witted glint in his eye, which all his long-term friends on Koh Phangan are familiar with. Inspired by fantasy, nature, travel and other artists, Colin also received early encouragement to paint, he says, from his paternal grandmother. When I ask him what's with the psychedelia, he replies, "What's not with psychedelia?" Colin was always fascinated with colour and patterning as a child, and admits, "Yes, I have dabbled in intoxicants - I was a hippy in the 1970's. Of course, I indulged in all the usual ways!" On the hippy trail through Asia in the mid 1970's, Colin travelled through Nepal, India and Burma, en route to Thailand. He arrived in the Spring of 1976. He stayed in Bangkok at the Atlanta Hotel - 'in a wood and tin shanty on Sukhumvit Soi 22' - with a motley crew of bar girls, addicts, alcoholics and wanderers. He was 25 yrs old. Back then, in pre-Khao San Road days, there weren't so many backpacker luxuries on the streets of Bangkok. Colin survived on a diet of 5 baht dried squid, Vitamilk, Thai sticks, prawn crackers and Singha beer. Having arrived into Bangkok almost penniless, it was a feast fit for a vagabond king. 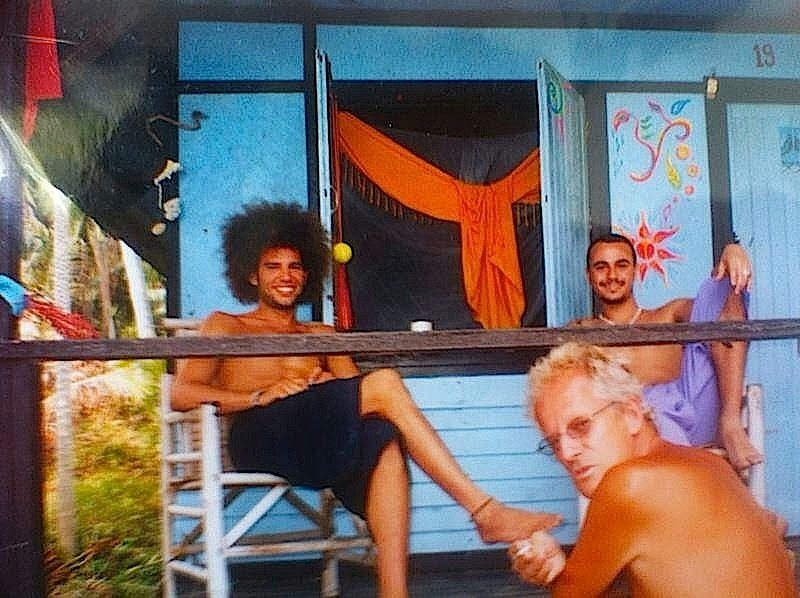 Despite arriving to Thailand in the mid 1970's, it was 1992 before Colin arrived on Koh Phangan, at a time when the allure of the island was nature, people and beaches. 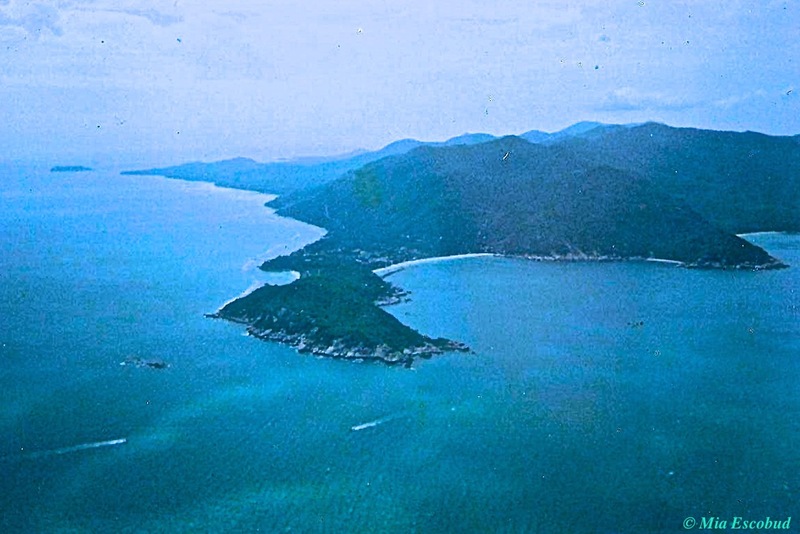 "Koh Phangan was a nature haven, with fantastic walks. That was my original reason for returning... And party, party, party!" 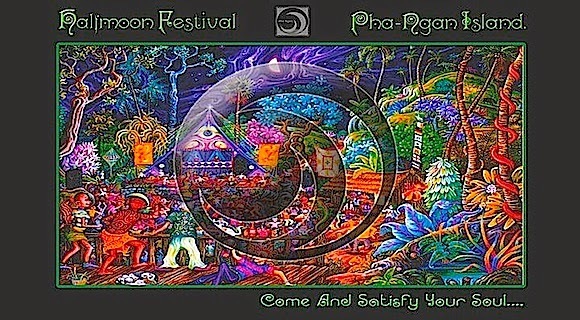 "Back then the Koh Phangan party scene was small, friendly, low tech and big fun. NOW it's high tech, costlier, busier... BUT still big fun!" 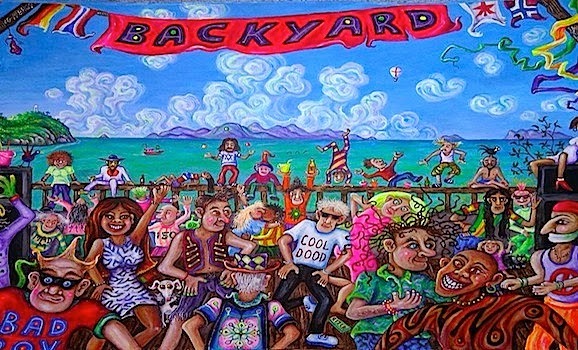 Not surprisingly, Colin's all time favourite party is the Back Yard, which shows in his artwork. 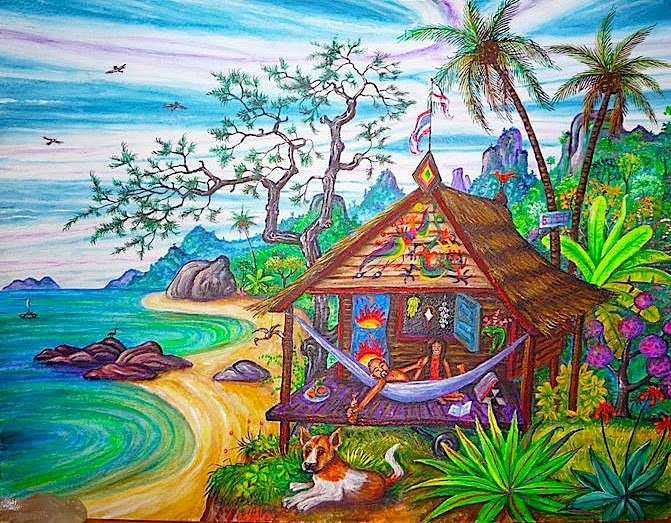 This painting from 2013, depicting a real life host of Koh Phangan characters, has been shared never-endingly in Koh Phangan circles this season. It is as relevant today as it would have been 20 yrs ago. "Great location, great music, friendly people... great memories!" "Half Moon was the best party - it still is the best looking!" 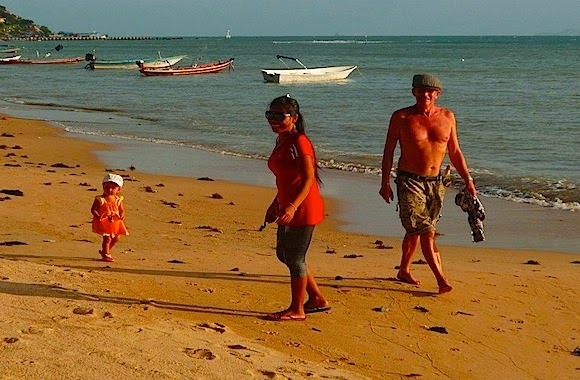 With the rumour breaking in 2014 that all parties except the Full Moon Party were about to be shut down, and a crackdown happening on the islands, Colin was questioning would the scene move elsewhere. "They killed Goa... now Koh Phangan? Wait and see. A glitch, maybe? Let's be optimistic." "Meanwhile keep cool in the heat... where's my fan???" then Tiara, Bangson, Rainbow and now Laid Back!... Viva Sunset Side!!!" I asked Colin to tell us about Pit and becoming a father at 60. "Pit is the loveliest lady, and being a dad at 60? Why not!! Life is all changes". Is there anything else he wants to add? "I met some of my bestest ever friends on Koh Phangan, and of course my darling Pit. Koh Phangan was and is my life." "Although I'm not too bothered by dust to dust, when I am dead it's in my will for my ashes to be sprinkled in the sea at Sunset Side Haad Rin. Sometimes I worry about getting old and decrepit... Sometimes I worry about the world at large... BUT mostly I don't give a damn. WHOOPEEE!!!!!!!" The Koh Phangan elixir of youth certainly seems to have cast its magic spell on Colin. Here's to many more seasons in the sun and many more paintings to come! See you on Haad Rin Sunset in December, Colin! All artwork is by Colin G Thomason, and commissions are available. Contact him here or visit NB Art Cafe, Ban Tai where his art is for sale! Is the Party Over for Thailand? Copyright @ Mia Escobud 2013. All Rights Reserved. Picture Window theme. Theme images by Sookhee Lee. Powered by Blogger.